The Slow Food Russian River Book Group will be discussing the book Poor Man’s Feast: A Love Story of Comfort, Desire, and the Art of Simple Cooking (Chronicle Books, 2013) by Elissa Altman. To RSVP email the Book Group at sfrrbookgroup@gmail.com. 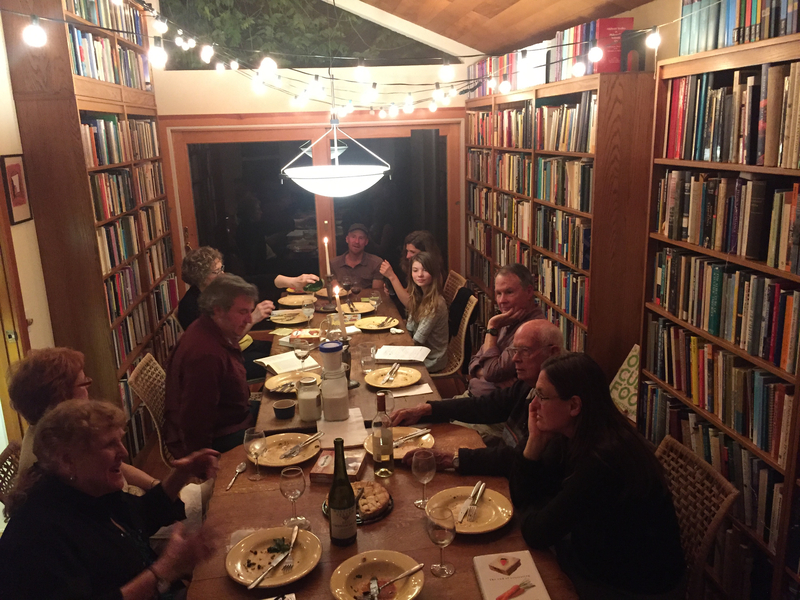 The Slow Food Russian River Book Group is open to anyone who can read, loves cooking a dish, and likes a good conversation. You don’t need to be a member of Slow Food, although – of course – we hope that with time you will become one. Location in Sebastopol with RSVP. From James Beard Award-winning writer Elissa Altman comes a story that marries wit to warmth, and flavor to passion. Born and raised in New York to a food-phobic mother and food-fanatical father, Elissa was trained early on that fancy is always best. After a childhood spent dining everywhere from Le Pavillion to La Grenouille, she devoted her life to all things gastronomical, from the rare game birds she served at elaborate dinner parties in an apartment so tiny that guests couldn’t turn around to the eight timbale molds she bought while working at Dean & DeLuca, just so she could make tall food. Elissa Altman writes Poor Man’s Feast, winner of the 2012 James Beard Award for Individual Food Blog. A food and cookbook editor as well as writer, her work has appeared in Saveur, the New York Times, Gilt Taste, the Huffington Post, and has twice been selected for inclusion in Best Food Writing. She lives in Conneticut with Susan Turner and a small herd of animals. An Interview with Elissa Altman, Food Blogger and Author of Poor Man’s Feast by Claire Stanford, Posted in Books & Media, Out & About on Wed, 03/20/2013. Poor Man’s Feast, a blog. Contents Taking stock: big food shopping advice — The basics: how to make everyday essentials go the distance — Big food stocks and soups — Big food salads — In the beginning: big food on appetizers and other small dishes — Brain food: big food on fish — Into the henhouse: big food on poultry — The big beef: big food on beef (and lamb) — In a pig’s eye: big food on pork — Big food on wine — How long will it last? Maximum freezer life chart. Summary Explains how shoppers can make the most of the cost-saving benefits of buying foods in bulk by offering taste-tempting tips on food storage, meal planning, shopping, and 125 recipes for cooking creatively. Love the One You’re (Eating) With: a Review of ‘Poor Man’s Feast’. March 4 2013, by Amanda Bloom.